Book Review: Tina Okpara's "My Life Has A Price"
Translated from French (Ma Vie a un Prix) by Jolie Jodter, My Life Has a Price is one of the books I got at the London African Book Festival and is Tina Okpara's memoir. Written in conjunction with journalist Cyril Guinet, the memoir covers her life in Nigeria as a young girl, to her being adopted at 12 by the Okpara family (Godwin Okpara was a former football player for the Nigerian Super Eagles as well as many European teams, including the French team Paris Saint-Germain), her initial life in France, her next 5 years in France being abused physically, psychologically and sexually by her adoptive parents, her eventual freedom from the Okpara's, and her life after escaping. While on one hand this is a story of exploitation, this is also a story of hope, and the strength of a young woman. I am choosing not too say too much about this memoir, not because I do not have much to say, but because it is hard for me to do so without giving too much away. I do want to say though that some stories need to be told and shared in order to raise more awareness about the issue of child trafficking, the use of young girls in many homes as domestic workers, and also the many forms of abuse trafficked children face - and this is one such story. At the African Book Festival, which Tina Okpara attended, there was a very emotional Q&A that followed after the book reading. Many things she said struck me - still having to bear the Okpara surname was one of them, but the other was her saying that she was "lucky [it] happened in Europe", because if all that she experienced happened in Nigeria, she "would be the one going to prison". The Okpara's were big people, and in Nigeria their wealth and big man status would have probably exempted them from their crimes, thankfully this wasn't the case in France for Tina. I thank Tina Okpara for being brave enough to share her story and I only hope that with time no young girl (or boy) experiences what she has experienced. All that's left for me to say is if you are able to, do grab a copy, read it, and share it. Read the book and i was moved to tears several times. However, i commend Tina for bin brave enough to not only talk about it but also write about it. I hope with all my heart that no girl or boy goes through this harrowing experience, but Hope is all I have. 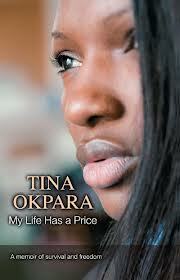 Tina Okpara is truly the bravest and boldest woman I know today. Hi Anon, All we can do is hope that the more visible and public stories like Tina Okpara's are made, the more likely things can be done to prevent the initial reduction (and with time, complete removal) of such practices.